Reel Kind is a five reel, and twenty win line classic fruit machine powered by Novomatic. 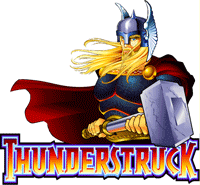 The slot is online on many popular Casino’s and also available as an iPhone app. 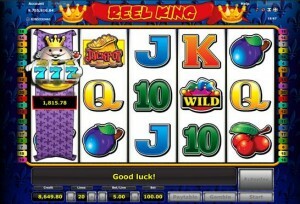 Click here to play Reel King now, or read this review to find out more. Reel King looks great with it’s vibrant, eye catching color scheme and classic, almost retro look symbols. Symbols include the classic plums, cherries, 10, Q, J and K. other symbols include the Jester Hat wild symbols the Jackpot symbol and the Reel King character. All winning combinations come in 3-5 like symbols, appearing in succession from left to right. The Jester Hat wild symbol substitutes for all other symbols to create a wining combination, helping you on your way to winning big! There is no scatter symbol in Reel King. Nudge or Hold features, as in many classic British Fruit Machines, are also not available. Gamble– Reel King offers a chance to double any win (up to 200.00). The gamble feature is automatically activated after every wining spin. On the gamble round, a flashing golden bar appears on the screen. The player must click on the “Gamble” key exactly at the time the bar is lit to double his original win. 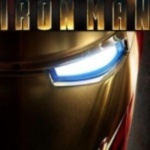 The players can gamble his winnings again and again for up to 7 rounds or until a no-win round is played. Reel king – The Reel King features activates randomly, between rounds. Each reel has its king, so up to 4 Reel King characters can appear on the screen. 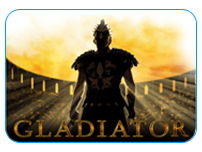 Each character has its own 3 reel slot that can be played for additional winnings. Wining combinations in the Reel King round include different combinations of 7s. 3 red 7 symbols win the player 10.00. According to the official version, this features wins the player between 5-500 his original bet, and thus does offer the opportunity to win a serious amount of cash(! ), 50,000 to be precise. But that’s if you are lucky enough to hit the jackpot on a 100 Euro bet. Reel King is not progressive but does have a huge jackpot a great Return To Player (RTP) percentage of 94.00. This is an all round great slot, perfect for beginners and veterans alike.